The Senators might have a trade brewing, rumours regarding the NHL at the Olympics and an Ilya Kovalchuk update in today's Rumour Report. The Ottawa Senators appear to be working on a trade, according to GM Pierre Dorion. Dorion also said that his team was mostly done its summer shopping, but "might be in the checkout line right now". Who might the Sens be looking to move or acquire? We know they've sought another defenseman following the loss of Marc Methot in the Vegas expansion draft. 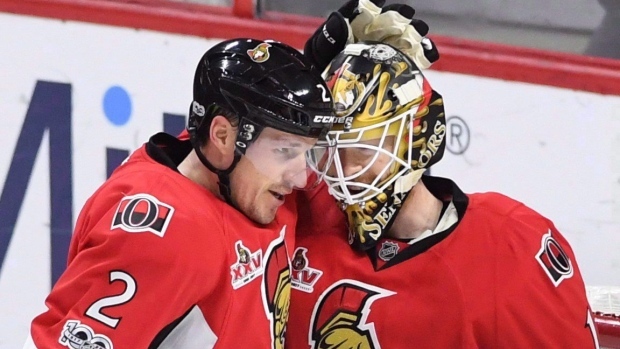 They've also put big salary blueliner Dion Phaneuf and AHL-bound goaltender Andrew Hammond on the market. Rumours suggest a Phaneuf for Marian Gaborik or Dustin Brown trade may have been discussed with LA closer to the draft. On the free agent market, the Sens have been linked to Francois Beauchemin. The plan for Ilya Kovalchuk is to make his long-awaited return to the NHL in 2018 after one final year with SKA Saint Petersburg of the KHL. The Panthers, Rangers, Golden Knights, Canadiens, Sharks, Maple Leafs, Lightning, Blue Jackets and Blues all showed varying degrees of interest. Rumours continue to suggest that the NHL has a contingency plan for Olympic participation and a game schedule adjustment that would be needed. Many stars have vocalized their displeasure with the league's decision not to send its players to Pyeongchang, with some threatening to go anyways. It still seems unlikely that the NHL would change its mind at this stage, but pressure from players like Alex Ovechkin, Sidney Crosby and Jonathan Toews might offer a glimmer of hope. The free agent frenzy has grinded to a halt as teams play chicken with the remaining UFA players. Rumours suggest the Blackhawks may be eyeing Cody Franson, while there's plenty of rumours around Andrei Markov, from signing with the rival Leafs to a deal with the Flyers. In all likelihood, the Canadiens will be the ones to cave and give Markov the contract he's looking for. The Bruins seem to be trying to hold onto Drew Stafford. Veteran forwards Jaromir Jagr, Jarome Iginla and Shane Doan continue to hold on in hopes of landing a new NHL contract. Like NHL Rumour Report on Facebook for the latest rumour updates!